There might occasions when we have run out of vegetables but still might have to prepare a Kuruma. Onion Kuruma, which tastes very much like Potato Kuruma can come handy in those circumstances. 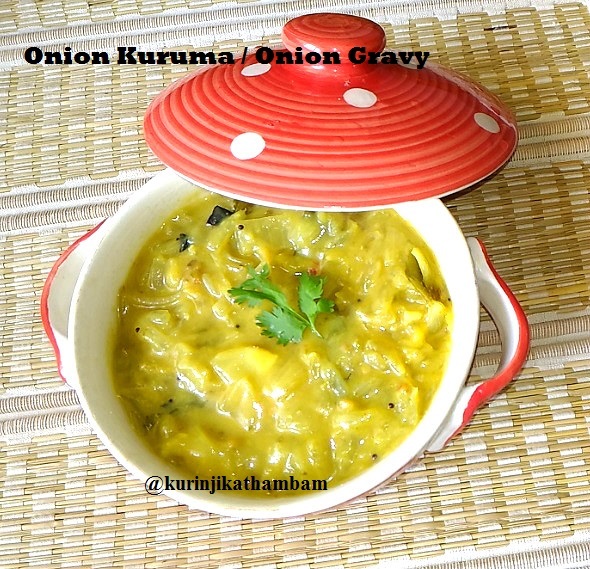 Moreover, Onion Kuruma will be refreshingly different kuruma for those who got bored with Vegetable Kuruma. 1. Remove the skin of the onions and cut them into small pieces. 2. Clean, wash and chop the coriander leaves into very small pieces. 3. 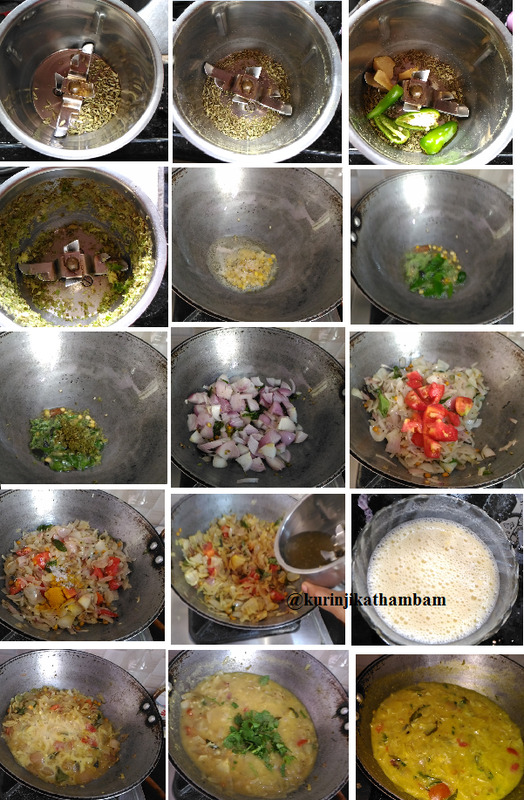 Mix the gram flour with ¼ cup of water without lumps. Keep it aside. 5. Powder the fennel seeds using the dry mixe. Then add ginger and green chillies. Grind them into a coarse paste using little water. 7. Then add the cinnamon, Bengal gram and curry leaves. Sauté them for few seconds. 8. Now add the ground paste ( from 5) and fry till the raw smell goes off. 9. Now add the chopped onion (from 1) and sauté till the onion becomes translucent. 10. Then add the chopped tomato (from 4) and sauté till they become mushy. 12. Now add the gram flour solution (from 4) and salt. Mix them well. Allow it to cook till the gravy becomes thick. Suppose the gravy is too thick, add some more water to bring gravy consistency. 13. 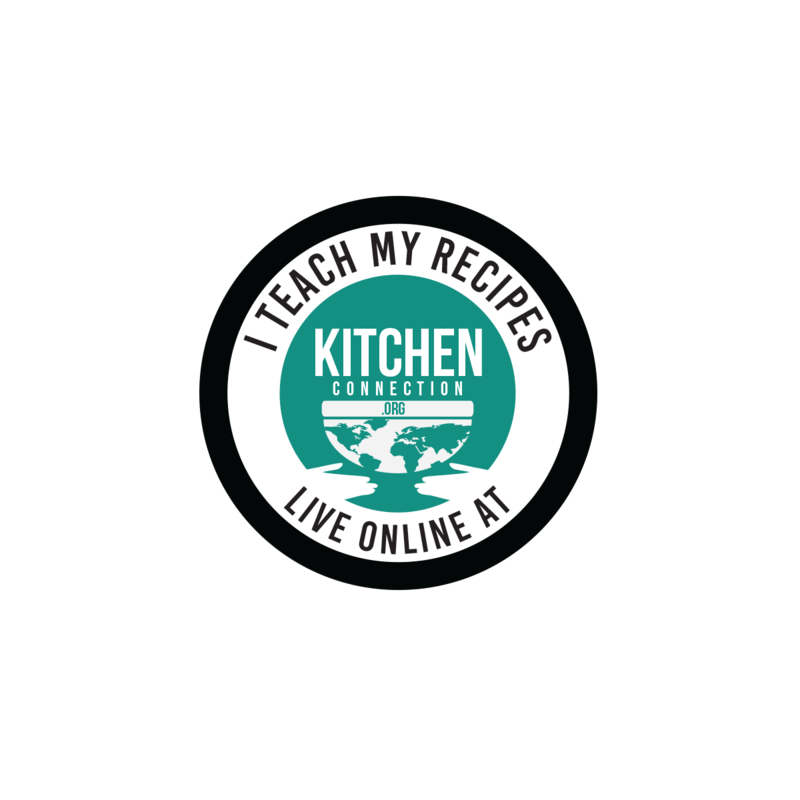 Switch off the flame and add the chopped coriander leaves (from 2). Mix them well and transfer the gravy into the serving bowl.